Whether you are looking to complete a project all at once or over a period of time, it is a good idea to develop a plan, a road map if you will. 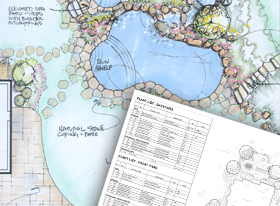 Sometimes a quick concept drawing will do to get some ideas flowing but a nice master plan allows you to visualize what could be and allows our team a blueprint to follow while creating your landscape. Many times the cost of a plan is saved many times over by doing it right the first time! We hand select trees, shrubs , perennials and groundcovers to bring texture and color to your property while providing a relaxing and serene environment. Trees provide us with shade and, help cool our homes, while plants cleanse our environment and increase the value of our home more than any other investment . 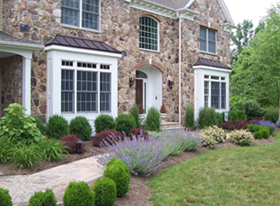 Hardscaping is the backbone of any landscape plan. 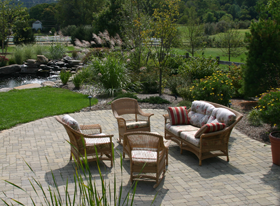 By using Stone, pavers or even wood you can define outdoor living spaces. You can define floors and walls in your extended outdoor space. 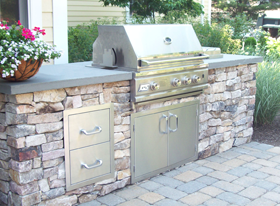 Natural stone walls, boulder outcroppings, engineered block walls, they all offer unique benefits to solve any landscape design challenge. When you see the results, you will want to be living & entertaining outdoors! Many people are combining many of the mentioned elements on this page to create the perfect backyard retreat, where they can escape and enjoy a staycation everyday! If you can dream it we can build it for you! 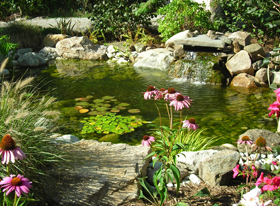 A simple fountain, a Koi pond, any excuse at all to hear the relaxing sound of water! The sound of water is a great way to transform any space into a paradise that is soothing and tranquil. Lose the sounds of the human world , sit back and relax, and let us create a retreat for you and your family. Outdoor Kicthens , firepits,and garden and patio structures such as pergolas are just some of the things that we offer to expand your enjoyment of the outdoors. We can custom design and build these elements to match your tastes, site and architecture of your home. 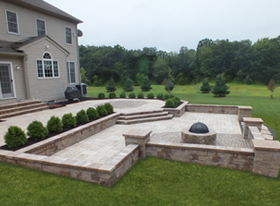 No landscape is complete until you have considered the nightscaping options available. 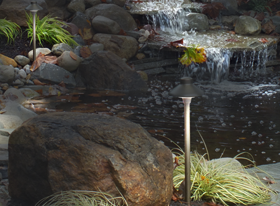 Illuminate your home and front landscape, garden paths, trees, pool areas and just about any other element in the landscape. There are many options to help you extend the enjoy your investment! New led lighting is very cost effective and long lasting. Many of our clients find our maintenance services an attractive alternative to doing it themselves. 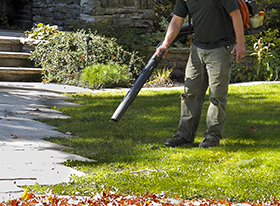 From Spring clean ups to lawn mowing to seasonal pruning and color we can help with all aspects of you home’s exterior up keep.